Mid 2015 our BVA teams envisioned to fully renovate their approach for measuring public opinion. To go beyond traditional polls: we explored how to listen to what citizens spontaneously say instead of just asking questions. That’s how POP 2017 project started. 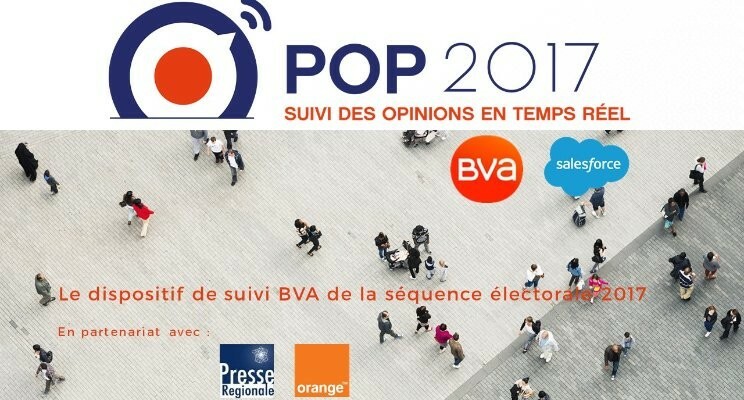 Co-developped with Salesforce: POP2017.fr is a unique platform combining real time Social listening, Live community forum, and Opinion Polls. POP is an acronym for Public Opinions Platform and was officialy opened 1 year ago. Don’t break what works for the sake of technical novelty. There is also a way to innovate in trying to improve your output in nature, not just in scale or accuracy. Staying true to yourself, hybridization can beat disruption. First cross-fertilize people’s expertise (political science, social networks, behavioral economics). Technique and tools should come after, particularly when you want to make sense of data reflecting human behavior. By early decoding electoral volatility we could reframe our analysis in a whole new way, also commenting how hot social reactions can enlighten individual’s cold decisions. Drive responsible thinking about your data impact. Unlike some players, we resisted temptation of moving into “predictive” claims: because we observed that claiming a winner in advance both ruins democratic feeling (others decide for me) and undermine voters motivations (what’s the use…). Presenting strenght and weaknesses, switch potentialities, solidity of decisions, uncertainty levels leaves everyone free to make an informed choice. If some stakeholders misuse, bash, or manipulate your data : it is your job to make it easy to interpret and safely re-used. Doing the pedagogy and the data-visualization to help generic users avoid misinterpretation or debunk fake conclusions is your responsibility. I’m particularly proud of what we did with our on-line video mini-serie A poil les sondages, explaining what a poll can or can’t do, and at the same time encouraging people to vote. For these remarkable achievements, I would like to deeply thank all those who brought this project to life: Adélaide Zulfikarpasic, head of BVA Opinion department, and her team, as well as my Innovation and Communication teams. Despite all the external pressure and the technological challenges we had to cope with, they worked hand in hand with passionate commitment to make it happen. I also warmly thank our partners Saleforce, Orange and the Regional Press who have supported us all along the way. Now that POP2017 approach is “election proofed”, I can say “long life to POP…” now beyond 2017.